Film-Arcade.net: B Movie Maina is Present in the Upcoming Larry Cohen Documentary "King Cohen"
B Movie Maina is Present in the Upcoming Larry Cohen Documentary "King Cohen"
Dark Star Entertainment recently released the official poster and trailer for their upcoming documentary "King Cohen". The film focuses on writer/director Larry Cohen and the films that he has been involved in. The documentary also features interviews from Martin Scorsese, J.J Abrams, Joe Dante, Mick Garris, John Landis, Fred Williamson and Larry Cohen himself. "King Cohen" hits theaters in limited release and on July 27th. 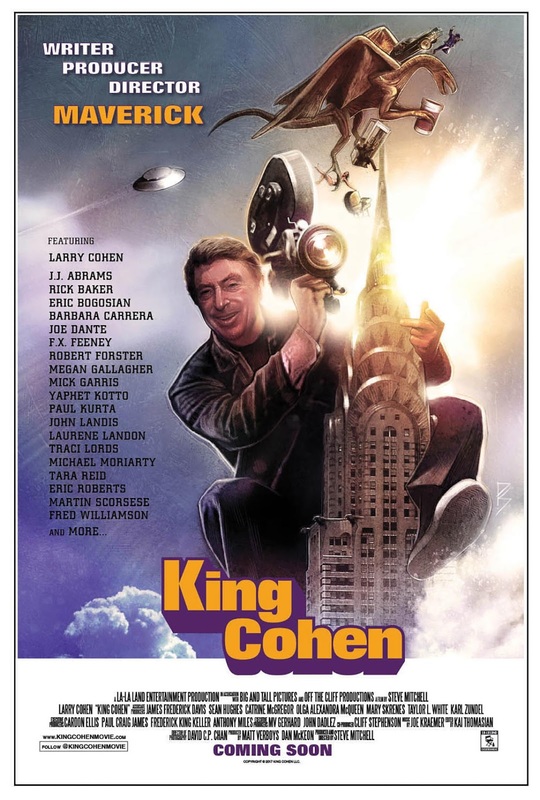 The highly anticipated King Cohen, the true story of writer, producer, director, creator and all-around maverick, Larry Cohen, will receive a full theatrical run across the U.S - including Los Angeles and New York - beginning July 27 courtesy Dark Star Pictures. King Cohen begins its theatrical run July 27 in markets including Los Angeles and New York. Special event screenings of the film will also be held throughout July and August in cities including Asheville, VA and Yonkers,NY.